ZBrushCore provides two different ways to manipulate your 3D models on the canvas. The Gizmo 3D Universal Manipulator is the perfect way to quickly Move, Scale and Rotate your models. The TransPose Action Line is ideal for more advanced transformations, including deformations to pose a character. At the top of the ZBrushCore interface, you can click the Move, Scale or Rotate icons activate either of these functions. These buttons initially activate the Gizmo 3D manipulator. By clicking off the Gizmo 3D Universal Manipulator, you will switch to the Transpose line to for advanced manipulation and posing of your 3D model. See this page to learn more about the Gizmo3D. See this page to learn more about TransPose. With the Sculpting Brushes you can apply many different effects as you sculpt, allowing you to create the look and feel you are after. For example, use the Clay Buildup brush to quickly block out a form or the Move brush to change the shape of a character in dramatic ways. Use hPolish to add hard surface details or use an Insert Multi Mesh brush to add pre-made shapes such as rivets, buttons, handles and so on. You can even modify some brushes to create new ones that you can add to your toolkit. ZBrushCore 2018 has two Alpha3D brushes: the Chisel3D brush and the ChiselCreature brush. Upon selecting one of these brushes you will see the Mesh Selector on top of the canvas. This lists the available content for the selected brush. 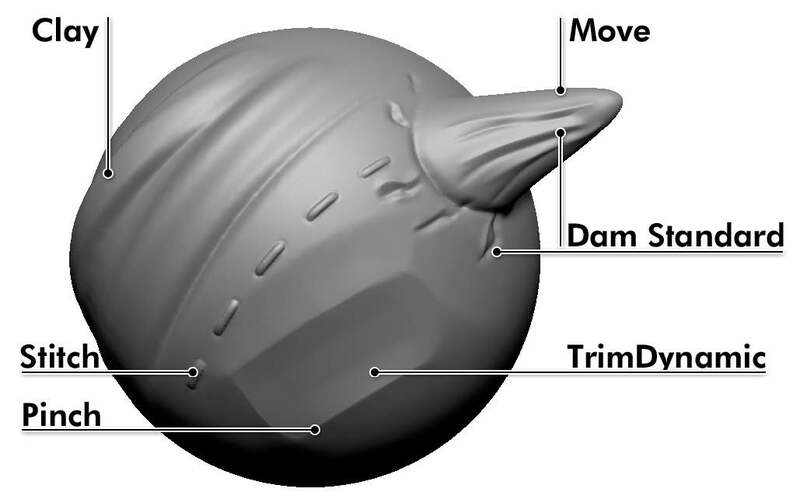 Simply pick a VDM of your choice, then click and drag the cursor on your model to sculpt it using the VDM shape stored in the selected brush. Some of the 3D Alpha brushes are set by default to work with the Drag Rectangle stroke. Feel free to change instead to the Freehand or Dot strokes, or even combine it with Lazy Mouse for more control or different results. At the top, some of the VDM’s used on the sphere. Smoothing softens and blends the contours of your model. To select the Smooth brush, press Shift on the keyboard. Holding Shift while sculpting will smooth the mesh. Release Shift to return to your previously selected sculpting brush. If you are using subdivision levels, then what is smoothed will depend on what level you are at. 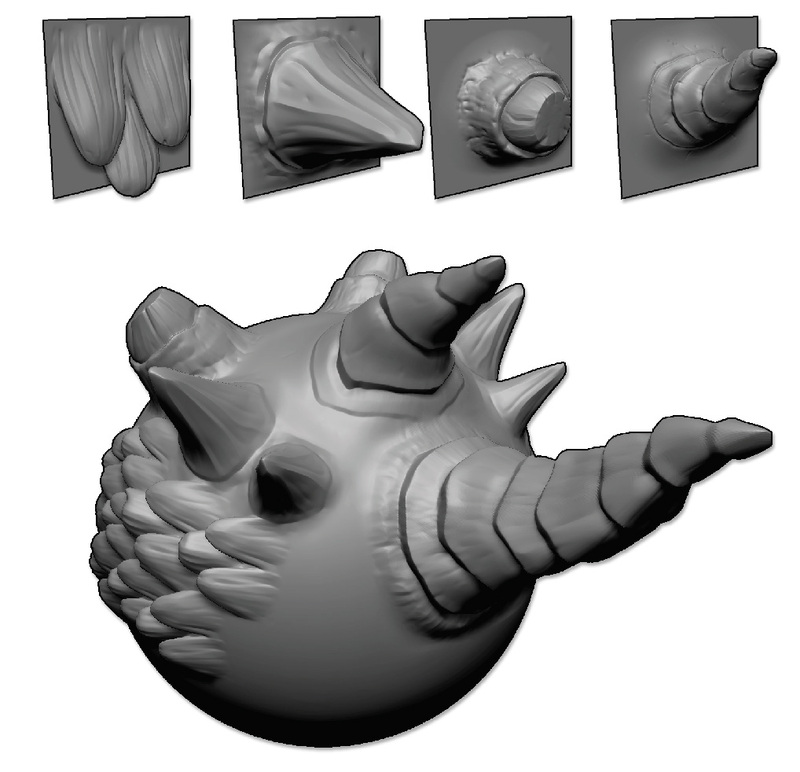 For example, if you smooth at the lowest subdivision level you can affect the general shape of your model while details at the higher levels will be preserved. On the left, the original model. On the right, the Smooth brush has been applied to remove or soften the details. Holding the Alt key inverts the current brush effect. 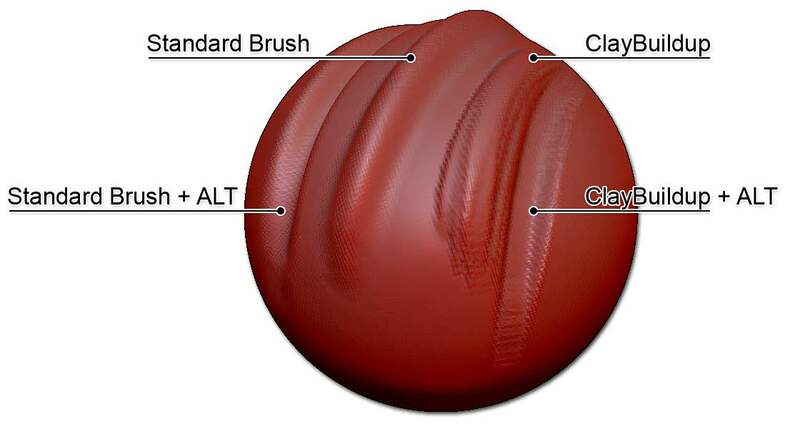 For example, the Standard brush pulls out the mesh surface, adding to it. Holding Alt will make it push in, cutting away material. The Alt key also works with the Selection and Masking brushes, inverting the selection or unmasking as you draw. Two different brushes applied, without and with the ALT key. Notice the push-pull effect.